This week’s theme includes Asian-themed kitchen items and Asian-inspired food, laundry products, Valentine’s Day flowers, and easy lunch box foods. 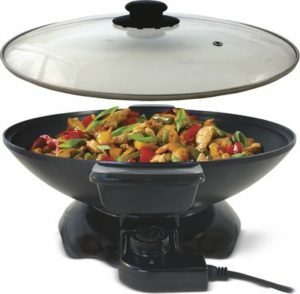 Ambiano Electric Wok, $29.99. This wok does not require a stove in order to use it. Simply plug it in. Crofton Stir-Fry Wok Pan, $9.99. Features a 12″ diameter. Ambiano 16-Cup Rice Cooker, $14.99. Cooks rice and steams vegetables. Crofton Teppanyaki Grill Plate or Reversible Griddle-Grill, $14.99 each. Crofton 2-Piece Bamboo Cutting Boards, $7.99. Crofton Chef’s Collection Asian Knife Assortment, $9.99. Choose 6.5″ Nakiri Knife, 7″ Santoku Knife, or set of 4.8″ Multipurpose Knife and 3.5″ Paring Knife. Crofton Manual Knife Sharpener or Sharpening Steel, $7.99. Crofton 5-Piece Bamboo Utensil Set, $3.99. Crofton Asian Wok Utensils, $3.99 each. Choose a Ladle, 2-Pack Tongs, or Spider Skimmer. Fusia Sushi Assortment, $5.49 for 13.5–15 oz. Sold frozen. Fusia Fresh California Roll or Spicy Surimi Roll, $3.29 for 8 oz. Fusia Kung Pao Chicken or Veggie Mini Egg Rolls, $1.99 for 7 to 7.5 oz. Sold frozen. Fusia Crab Rangoon, $2.49 for 6 oz. Sold frozen. Fusia Crunchy Rice Rolls, $1.29 for 2.8 oz. Fusia Asian Noodles or Rice Mixes, $0.89 each for 4.4 to 5.7 oz. Fusia Tempura Batter or Coconut Panko mixes, $1.99 for 6 to 10 oz. Fusia Szechuan or Sweet and Sour Stir Fry, $2.89 for 21 oz. Sold frozen. Fusia Asian Sauces, $1.99 each for 14 to 14.5 oz. Fusia Asian Broth, $1.79 each for 32 oz. Fusia Chicken & Vegetable or Pork & Vegetable Wonton Soup, $2.19 for 10.75 oz. Sold frozen. Fusia General Tso or Mandarin Orange Chicken Bowls, $2.29 each for 10 oz. Sold frozen. Easy Home Triple Laundry Sorter, $29.99. Easy Home 3-Tier Hanging Dryer or 3-Pack Wash Bags, $5.99 each. Choose a 3-Tier Hanging Clothes Dryer that fits over standard shower rods, or choose a 3-Pack of Mesh Wash Bags that includes 1 large and 2 medium bags. Easy Home Two-Bushel Laundry Basket, $5.99. Easy Home Nonslip Ironing Mat, $4.99. Magnetic corners attach to metal surfaces. Heat-resistant material protects countertops. Assorted designs available. Easy Home 3-Tier Rolling Cart, $9.99. Easy to assemble; no tools required. Assorted styles and colors. Easy Home Tripod Clothes Dryer, $14.99. Holds up to 36 garments. No tools required for easy assembly. Easy Home Handheld Fabric Steamer, $14.99. Perfect Petal Valentine’s Day Dozen Rose Bouquet, $12.89. Valentine’s Day 10-Stem Tulip Bouquet, $4.89. 5″ Easy Orchid, $9.99. Assorted colors available. Valentine’s Day Kalanchoe, $3.99. Assorted colors available. 5″ Anthurium, $7.99. Assorted colors available. General Mills Treat Bars, $2.49 for 6.8 oz. Friendly Farms Moo Tubes Cherry or Watermelon Yogurt, $1.79 for 18 oz. Millville Chewy Rainbow Chip Granola Bars, $1.49 for 8.4 oz. Clancy’s Southwest Ranch or Sour Cream & Onion Baked Potato Crisps, $2.29 for 6.25 oz. Clancy’s Ranch Veggie Straws, $1.89 for 7 oz. Read our review at this link. Lunch Mate Sliced Ham and Water Product, $3.69 for 24 oz. Lunch Buddies Fruit Bowls Variety Pack, $6.49 for 64 oz. Sesame Street 100% Juice Boxes, $1.89 for eight 4.23-oz. boxes. Black Forest Fruity Duos with Liquid Burst Center, $3.99 for 22.4 oz. Easy Home 12-Stitch Sewing Machine, $39.99. Fresh USDA Choice Beef Tenderloin Filet Mignon, $12.99 per lb. Fresh Thick-Cut Boneless Pork Chops, $2.99 per lb. Ambiano, Black Forest, Clancy's, Crofton, Easy Home, Friendly Farms, Fusia, General Mills, Lunch Buddies, Millville, Sesame Street. Bookmark. Holly and enchamade: We’ve never included all of the weekly ad’s photos in this roundup. You might be thinking instead of the ads on Aldi’s own website at http://www.aldi.us. They do have photos of everything there.